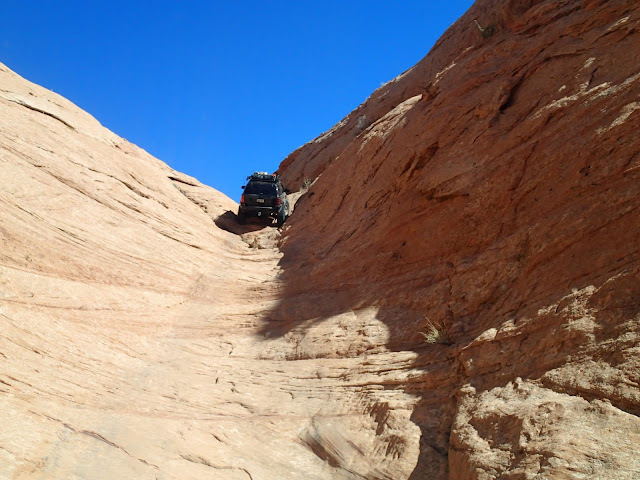 Though I have a great Jeep, this is not a planned part of my upcoming vacation. Several years ago, I read Undaunted Courage by Steven Ambrose. It is a good history of the Lewis and Clark expedition. 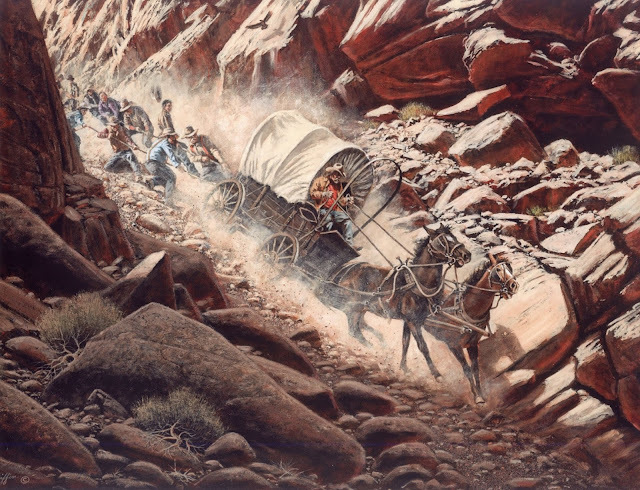 I am currently reading The Undaunted, by Gerald Lund, a historical fiction novel about a Group of Mormon pioneers settling one of the most geographically hostile parts of Utah. My mom loaned me the book after we heard a stirring account of bringing wagons down the Hole in the Rock at a Daughters of the Utah Pioneers meeting. The link will bring you to a brief history of the experience. 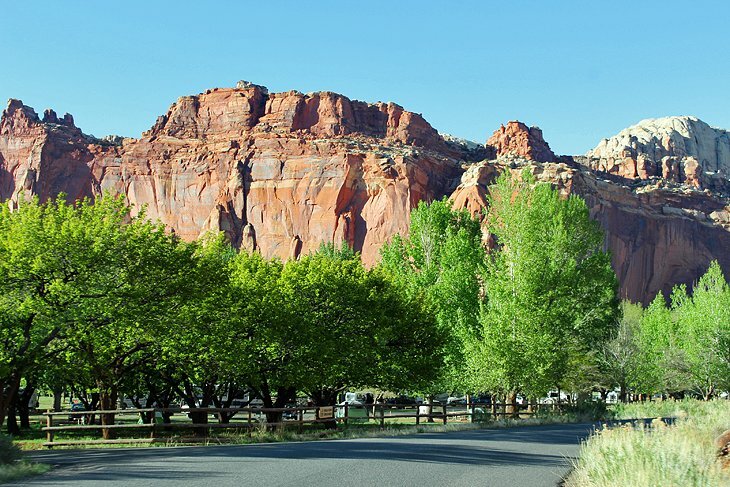 The reason I finally started is that next week I will be visiting Capitol Reef National Park, which happens to include one of the last Mormon settlements in Utah because central southern Utah is wild, rocky, arid country. My ancestors and my husband's ancestors were involved in settling some of the small towns in the desert, but I am having a hard time channelling ancestral strength right now. I suspect my biologic drug is failing me and RA's yell is no longer muted. Knitting has been hurting me lately. I'm not sure what overdoing knitting is defined as, but my arms and shoulders are unusually weak and painful. Of course, adventures have more than their usual effect. A couple hours at the aviary yesterday have left me pretty wiped today. I'm excited to go back to redrock country. 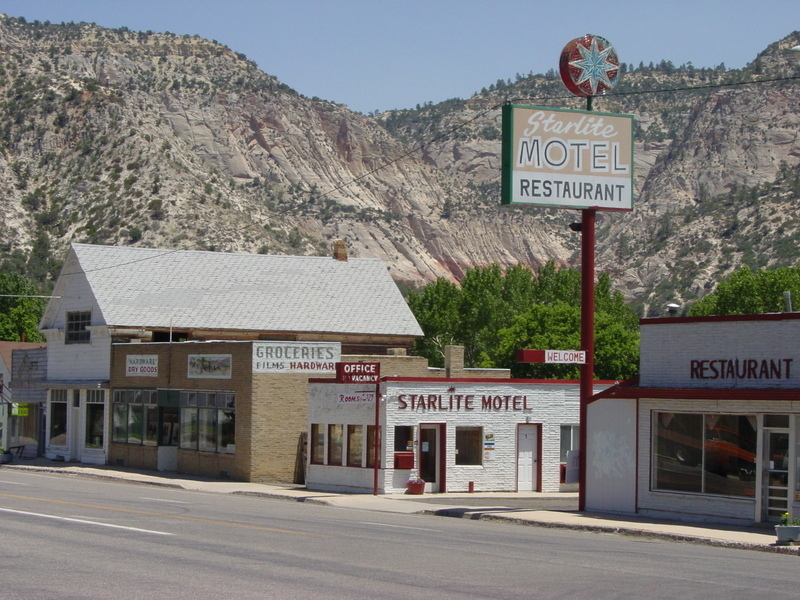 I grew up visiting grandparents living in Orderville, between Zions and Bryce. The Colorado Plateau holds a huge place in my heart. But I'm afraid that the excitement of travel will encourage me to overdo it and I'm afraid of the consequences in terms of pain and exhaustion. A lot of that fear is just travel anxiety. I always get emotionally keyed-up over a trip, worrying more than necessary about leaving home (in the hands of two very capable adults). Packing and planning seems nerve-racking, even though I am mostly mooching. My oldest son and I are traveling with my parents. We need to bring our breakfasts, lunches, clothes and toiletries. My son is also bringing a fancy car charger for our electronics and I am bringing enough books and knitting to last a month or two. How early settlers packed everything they thought they might need (until they could make or grow more) into small wagons and set out into the wilderness--especially more than once--is beyond me. Next week, probably a few days late, I will report on the lovely time I had in the shady Fruita campground and hiking a few short trails carefully chosen by my parents. This week I will overpack and stress. THE PODCAST is short and sweet. Emily Dickinson imagines looking at keepsakes in old age. I love the poem I found, and the button that mutes background noise, but am sorry to say that wearing the mic around my neck instead of over my ears results in a lot of fidgeting noise. I hope my listener can overlook the bumps. is mostly someone else's knitting. I was delighted to see yarn-bombing in person for the first time. Knitters like to create public art installations by covering everything in sight with knitting. 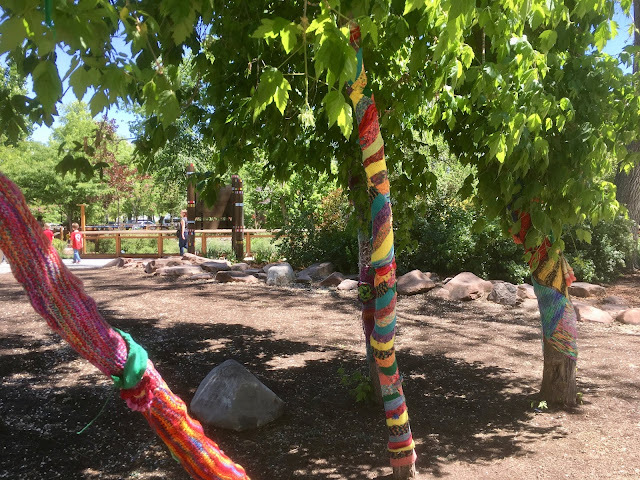 In this case, the Salt Lake Knitting Guild, an organization I should probably learn more about, has covered the trees, fences, and lampposts of the entry of Tracy Aviary. I have enough scrap yarn of sturdy acrylic nature to participate in such things. Maybe if I finish a few of the projects I have on needles, and my arms recover, I can do some yarn bombing of my own. For knitting while driving (riding) next week, I will be bringing the last of the mermaid tail blankets, which keeps getting set aside because I've made five of them already and it's not due until Christmas. Though I am attempting to knit while reading, so if it is finished, or nearly finished by the time I leave, there is also a ten-pack of weird boucle yarn I bought on clearance. It knits into an interesting furry, stretchy fabric and will probably be turned into a poncho. For knitting while thinking, like when the fitter members of the expedition go on longer hikes, I am bringing yarn for two different shawls of the same pattern. The yarns are both blue and very pretty. I'm not sure if the shawls will be for me or a family member or will eventually end up in my shop. My family members with summer birthdays should really look at my shop, ignore the prices, and chose gifts before I chose them for you. 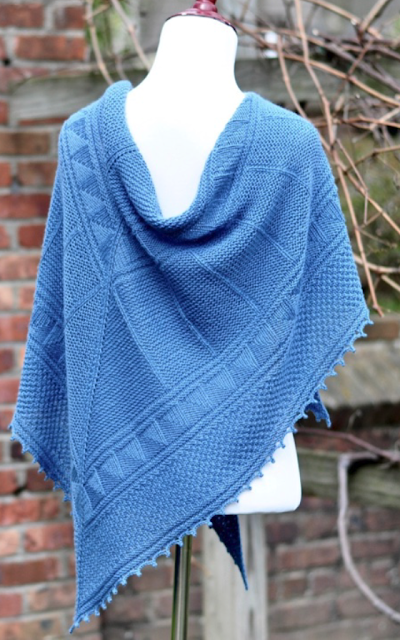 Since I haven't started the blue shawls yet, all I have to show is a picture from the pattern. I haven't packed a toothbrush yet, but I have printed the pattern and put all the yarn and accessories I'll need together in a bag. My readiness is a little different than that of my pioneer ancestors, to be sure.